You can’t really talk about speciality coffee in Belfast without talking about Established Coffee, which opened in December 2013. Located at the northern edge of Belfast’s historic Cathedral Quarter, Established occupies a surprisingly modern building on the corner of Hill and Talbot Streets. It’s a large, bright, uncluttered space that, during my visit, was constantly busy. Established serves coffee from Dublin’s 3FE and various guests on both espresso and filter. There’s usual a choice of three coffees, plus a decaf. One of these is always unique to Established, another is from a rotating cast of guests, while the third is only available as a batch-brew filter. Unusually, the other two are available as both filter and espresso. 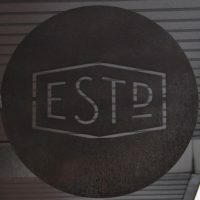 As well as coffee, Established has an extensive food offering, all cooked in the kitchen behind the counter. This is based around an all-day breakfast menu of poached eggs on toast, with various sides, supplemented by a selection of seasonal plates. If that doesn’t appeal, there’s always the option of toast or granola, plus a soup of the day. Everything’s available until the kitchen closes at three o’clock. If that isn’t enough, there’s always an interesting selection of cake to be had. Approaching Established Coffee from Belfast city centre to the south takes you through a series of winding, pedestrianised alleys, all lined with interesting old buildings, ideal territory for a coffee shop. However, just as you reach Established, you’re suddenly surrounded by a surprisingly modern, functional set of brick buildings, including the one housing Established. However, don’t let that put you off. Long and thin, Established sits on a corner, with the narrow side facing Talbot Street, while the long side runs down Hill Street. Although the address is Hill Street, I think of the narrow side, with double doors on the left, as the front. However, there is also a door towards the back on the left-hand (Hill Street) side. The seating’s all at the front, with the counter at the back. There are windows on both the Talbot Street and Hill Street sides, interlaced with wide, brick pillars, each with its own window-bar, two at the front and two down the left-hand side. These are wider, seating four and three people respectively, whereas the ones at the front can only manage two each. The space at the front is dominated by a single, 14-person communal table, clearly designed with the laptop-using remote worker/student in mind, since there are power sockets along the sides of the table. The rest of the seating is provided by a bench along the right-hand wall. There’s a two-person table, then three four-person tables and one final two-person table right at the back. Although the communal table is large, there’s plenty of space around it, allowing you to easily make your way from the door to the counter along the left-hand side. Alternatively, if you use the door at the back, you’ll end up by the counter, which is ahead to your left, while the seating is to your right. At the back of Established, the right-hand corner is cut off at 30 degrees, with the counter running parallel to the wall, leaving it at an angle to the main room. The angled nature of the counter means that there’s a large, open space between the counter and seating where people can queue or waiting for their (takeaway) coffee. Established could have crammed a lot more in, but the result is wonderfully uncluttered, giving Established a great sense of space, even when it’s packed. Whether you use the front or the side door, you arrive at the left-hand end of the counter, which starts with cake/till, before you reach a large, gleaming (Silver) Black Eagle espresso machine and its grinders. Next comes the EK-43 grinder for filter coffee, with the pour-over station at the end. I had a flat white, made with a single-origin coffee from Los Vientos in El Salvador, roasted by 3FE, but exclusive to Established (the alternative was a Rwandan from London’s Workshop). It was a great first coffee of the day, the coffee and milk complimenting each other, with a certain underlying sweetness to the coffee which went well with the milk. In an ideal world, I’d have stayed on and tried the Los Vientos as a filter coffee. Established usually uses the Aeropress, although occasionally, depending on the coffee, the V60 is offered, while if you are sharing, the Chemex comes into play. Pleasingly, filter coffee is served in a carafe with a cup on the side. However, I was short of time, so had to settle for the one coffee with my breakfast, where I went (unsurprisingly) for poached eggs on sour dough toast, adding mushrooms and spinach. The eggs were beautifully poached, while the toast was wonderfully crunchy. This entry was posted in Belfast, Breakfast, Cafes, Cake, Laptop Friendly, Lunch, Retailers and tagged include by Brian Williams. Bookmark the permalink.